What Makes Yumble Kids Different? How Easy Is Yumble Kids To Follow? As parents, we are always interested in having our children eat healthy and nutritious food. We know that their physical and mental development needs a wide range of nutrients to enroll at the best parameters. But, making a child eat healthily is easier said than done. 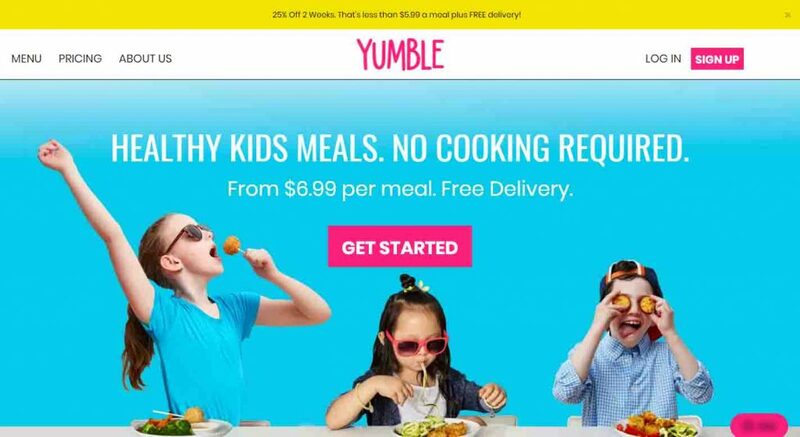 Thus, for all those parents that would like less hustle with their kids’ menu, Yumble Kids is the answer you’ve been looking for. This is a food delivery services that focuses entirely on creating meals for kids, by using only healthy and fresh ingredients. You can practically have everything covered, from lunches to dinners and snacks in between. Of course, everything is presented in a fun and attractive manner so that kids will want to eat their meals without pressure from their parents. Also, you will be surprised to find out that this service is more affordable than you may think. All the meals you order will just have to be heated. For this, you can use the oven or microwaves. Ever since 2016, this service has been making the lives of parents much easier, so it’s maybe time for you to enjoy it as well. With its help, you can save time to do the things that make you happy as well, instead of spending countless hours in the kitchen. The meals provided by the Yumble Kids menu are highly appropriate for kids with ages between 1 and 12 years old. If you want to find out more about this service, allow us to share what we discovered. Keep reading our honest Yumble Kids review to learn more. In order to be able to place orders at Yumble Kids, you will have to subscribe to the website. The subscription will grant you access to a wide range of kid-friendly meals, made out entirely out of natural and whole ingredients, and, whenever possible, with organic produces. Who takes care of these meals? They are created by experts in children’s nutrition, so you can be sure that the meals you order will be adequate to the needs of your kids. If you know that your child has certain dietary restrictions, like lactose or gluten intolerance, it would be best to mention such aspects as soon as you subscribe. This way, you will receive the best recommendations in terms of meals. Speaking of meals, the variety is rather diverse. There are 18 different meals to choose from on a weekly basis, plus 2 snacks that are always healthy options. The service allows you to order a number 6, 12, or 24 meals every week, according to your needs and preferences. Things get even better. In case you forget to place your order, there’s no need to panic, as the team managing Yumble Kids will choose the meals for you, based on what you previously ordered and other details you introduced in your subscription. This way there’s no danger of being left uncovered for an entire week. Also, bear in mind that you can change the details of your current subscription whenever you like. You can adjust the number of meals based on your needs, add or remove details, pause and even end the subscription as you consider appropriate. And you have to do nothing special for this, just to access your account and make the changes you want. If you already looked for solutions concerning your kids’ menu, you probably know that there are other similar services out there. So, what sets this one apart? The service was created by a woman who knows just how difficult it is to convince children to eat their veggies and other types of healthy foods. Also, considering that most mothers these days have jobs and a busy schedule, this challenge becomes even more difficult. Thus, Yumble Kids comes to their rescue, offering great alternatives that are also healthy and fun for kids. What kind of strategy is used to make children eat their meals? Besides sending specially created meals for them, the company will also send various items made to make mealtime more enjoyable. Thus, collectibles, coloring sheets, and crayons will help children associate meals with something fun. Also, they will receive a chart and golden stars, which can be used for meal tracking. When the chart is filled with stars, take a photo of your child with the chart and e-mail it to Yumble Kids and you’ll receive a surprise in return. The little one may also receive special coins, which can be collected and used in exchange for nice items. As stated in the previous lines, this services provides a meal plan with 3 different meals. The only thing that differs is the number of meals you would like to receive on a weekly basis. It is worth mentioning that the available menu changes in a constant manner, so your kids will not just enjoy a diverse diet, but won’t get bored of the food they get. But, even if it changes, the menu will always contain 18 main courses and 2 snack options. What will a meal contain? Because it is made in a balanced manner, it will be composed out of an adequate amount of carbohydrates, proteins, and veggies for precious vitamins. The available snacks come in bite sizes, so they will never be too large. You can opt between packages of 4 or 6 servings, so all you have to do is to split the snacks evenly throughout the day. Choosing adequate food for your kids was never easier, as they are properly labeled so you can choose gluten-free, vegetarian, dairy-free, or egg-free products according to your child’s dietary needs. Also, the majority of foods are prepared without coconut, peanuts, or other kinds of nuts, to avoid any allergic reactions. However, the meals are not prepared in a kitchen free of nuts. Once you receive the delivered meals, all you have to do is heat them up and serve them, as they are made to be consumed without any further preparations. Follow the instructions when it comes to the temperature and timing for heating each meal in the over. If you want to use the microwave oven, you need to know that the meals come in a package suitable to be used with microwaves. Thus, heating the meal is even more convenient. Still, even so, do not heat the package at more than 375 degrees. It is normal for a parent to want to check a meal’s nutritional value. When it comes to Yumble Kids, such information is available by simply clicking on a meal. If you do so, you won’t just see the list of used ingredients, but also nutritional details. If you ask us, all meals are made in a healthy manner and it’s great that some meals also contain organic ingredients. What about packaging when shipping the food? All the meals you ordered are tightly packed in adequate boxes, which keeps them safe and intact during shipping. To maintain an adequate temperature inside the boxes, the company uses a type of recycled paper, which keep the food cool. However, there was an incident in which all packages were covered in liquid, so we assumed that one of the boxes leaked. It is not a tragedy and we believe that it was a rare occurrence since no one complained about this things before, but it was still rather unpleasant to unpack the food from moist paper. Delivered in plastic trays that are sealed for safety, each meal will have its nutritional values presented on a label on top of the tray. If you want to heat the food in the microwave oven, it will be ready in 60 to 90 seconds. In case you want to heat it in the oven, it will add a few minutes more to the process, but some say that the food is crispier this way and even better tasting. Even in the case of children, it is highly recommended to have daily sessions of physical activity. They should enjoy at least 30 minutes, even a whole hour if possible. The service offered by Yumble Kids is extremely convenient and easy to use by all parents. The food is conveniently delivered at your doorstep and you get all the instructions you need when it comes to heating it right. After heating, the meal is ready to be enjoyed by your child. You can heat the meal as it arrives, in its package, as it won’t melt in the oven, as long as you respect the indicated temperature on the package. Besides this, it is nice to know that the package is environmentally-friendly. Plus the kids will always get something fun in the package as well, as an incentive to follow with their meal plan. Besides these accessible prices, you will be able to enjoy shipping free of any charges as well, which helps you save more money. But, for this, you will have to live in one of the US states where shipping is possible at the moment. Because we spoke of shipment earlier, it is worth mentioning that, for now, Yumble Kids delivers meals on the East Coast, in 26 states of this area. If you live in the West Coast, don’t fret, as the company prepares to expand its services on this side as well very soon. After placing your order, the meals usually arrive in a day or two. In most cases, the meals are delivered in the first three days of the week, so do expect for FedEx or Parcel Inc. to make a delivery during these days, depending on the area where you live. The website provides an FAQ section for additional information, but if you can’t find what you need there, you can always e-mail them or give them a phone call. The service is only available on the East Coast, in 26 states for the moment. Yumble Kids is a great service that helps parents to offer their kids healthy and diverse meals in a fun and interesting manner. With the provided meals, dinner time won’t be so challenging anymore. Delivered in an attractive manner, with nice colors and fun shapes, kids will love eating their food. Not to mention that Yumble Kids gives them the chance to collect coins and gold stars that can be, later on, turned into gifts and surprises. Although the service is currently available on the East Coast only, there are plans for the expansion of the business on the West Coast as well. Yumble Kids is a great choice for parents who want to introduce some varieties into their children's diet while staying healthy and relatively cheap. Healthy, prepared meals for kids including lunches, dinners, and/or snacks plus free activities and collectibles. You can set dietary restrictions as to which foods you would like to avoid. We found 2 verified Yumble Kids Discounts, Coupons and Promo Codes for Feb. 2019. If some of the Yumble Kids coupon codes have expired, please contact us, thank you for your help. If you like Yumble Kids but aren't sure whether it's the best ideal choice for you, and may want to compare Yumble Kids with other Companies' Plans, Products, and Services that similar to Yumble Kids, or Yumble Kids Alternatives and Yumble Kids Competitors, Which companies' services like Yumble Kids. You can take a look at our professional comparisons below to discover if one of them is more suitable for you.